Save some cash, and encourage your kids to show off their personal style with these easy DIY school supply projects that you can make together. Show your kids how to make their own pencil pouches, so they won't have to settle for those cheap plastic ones that break halfway through the school year. All you need is a piece of scrap fabric (or a fat quarter) and a zipper. If you have a sewing machine, show your kids how to use it. Otherwise, just pick up a bottle of fabric glue, and glue all the pieces together. Remember to put the good sides facing in, so everything will be facing the right way when you flip the finished pouch right side out to add the zipper. Since you're custom making these, go ahead and make the pouches whatever size you need. If those store-bought pouches always seem too small for their stuff, go bigger; or make more than one, so they can have one for markers, one for pencils, etc. 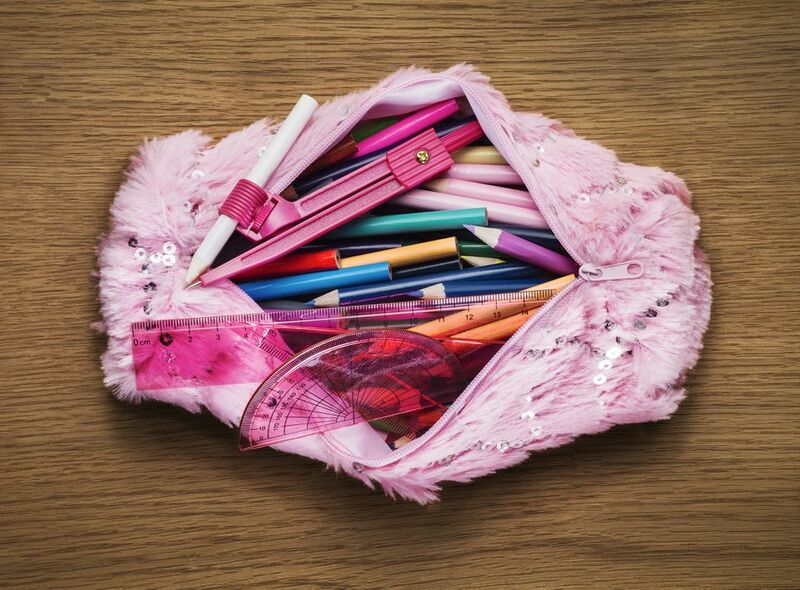 Try This: Save candy wrappers, cookie and chip bags and juice pouches, and use them to make your kids' pencil pouches. They'll make a really sturdy pouch, and encourage your kids to find creative ways to upcycle more of the things they're used to throwing away. Round up a bunch of pens and pencils from the junk drawer. Then, have your kids wrap them in Washi tape for an instant style upgrade. Encourage them to use the same tape to decorate the rest of their supplies, so everything coordinates––even seldom-decorated items, like glue. If you're in the habit of buying the plain notebooks to save money, let them personalize those with Washi tape, too. Try This: Have your kids wrap the cord for their ear buds, so they'll be easy to identify, if they accidentally leave them behind or drop them on the classroom floor. If you don't want to use up a ton of tape, just make a Washi tape flag for the end of the cord, and write their name on it. Easy and effective! Buy the cheap bottles of school glue (white or gel). Then, glam them up by adding color and glitter. To get the color you want, just stir in a couple drops of food coloring, or show them a trick from your school days, and color the glue by dropping in the ink cartridge from a dried up marker. Just be sure to use the cartridge from a washable marker, if you want the glue to remain washable. Try This: Make several colors of glue, so your kids can use them like paint. They'll love squeezing the bottles to create designs on their paper, and when the glue dries, the color and raised texture will be left behind. Fun! Turn a mint tin or another small container into an ear bud case for your kids. Let them decorate the outside of the container with scrapbook paper and decoupage medium, stickers, rhinestones or whatever craft supplies you happen to have on hand. Try This: Add a keychain, so your kiddos can hang their ear bud cases on the outside of their backpacks. This will make it easier for them to find their ear buds and put them away when they're done. Brilliant! Buy your kids the binders with the clear fronts, so they can customize them with their own designs. There are lots of free binder cover printables that they can use as a jumping off point. Just search Google or Pinterest for "printable binder covers," and you'll find all sorts of fun options. If your kiddos are super artsy, they may even want to create their own designs from scratch. Try This: Print a different color binder cover for each subject, so they'll be easy to identify at a glance.